Grilling tilapia is a great way to pull out the flavor in this subtly delicious fish. Since tilapia is known for being a light and flaky dish, it is important to enhance the flavor with the proper ingredients that we recommend in these recipes below. Don't be afraid to tweak the seasoning ingredients in our recipes as we always encourage customizing a base recipe to your liking. We hope you enjoy grilled tilapia and incorporate it into your regular diet because it is low in fat, sodium, carbs, and calories. 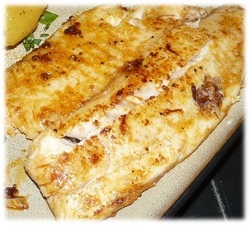 Grilled Tilapia Fillets - This is a basic grilled tilapia fillet recipe that is simple and fast to make. You will have these on and off the grill in 10 minutes or less for a healthy dinner.